NSCAD students can apply for an internship or design practicum as part of their program in their 4th year of study. These courses are designated for 3, 6, or, in exceptional circumstances, 9 credits. Students are expected to apply for an advertised placement by submitting a cover letter and resume by the advertised deadline. Most opportunities are available during the Spring / Summer semester and are advertised in February. The placement supervisors will conduct interviews with qualified applicants and make a selection. Once a student has been selected they will meet with the Coordinator, Off Campus, International and Advising to discuss their formal “registration”. A student must submit a written overview of the position, how their skills match the opportunity and how this placement will contribute to their curriculum growth. Once approved by the Faculty Supervisor and the VP Academic and Research the student will be registered for the course. Internships and Practicums are a great way for students to put to use their skills learned to date and to begin to see how their abilities can be translated to real world problem solving. 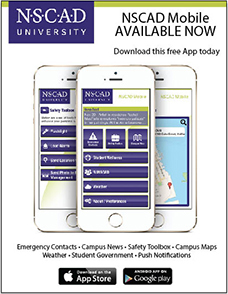 Organizations often contact NSCAD University to seek support on projects from students in the visual arts, craft and design world. These opportunities are shared via email, on bulletin boards around campus or through faculty. If you are interested in receiving job calls please contact let us know. Email jfarmer@nscad.ca.